I remember the first time I laid eyes on this scene 25 years ago as vividly as if it were yesterday. 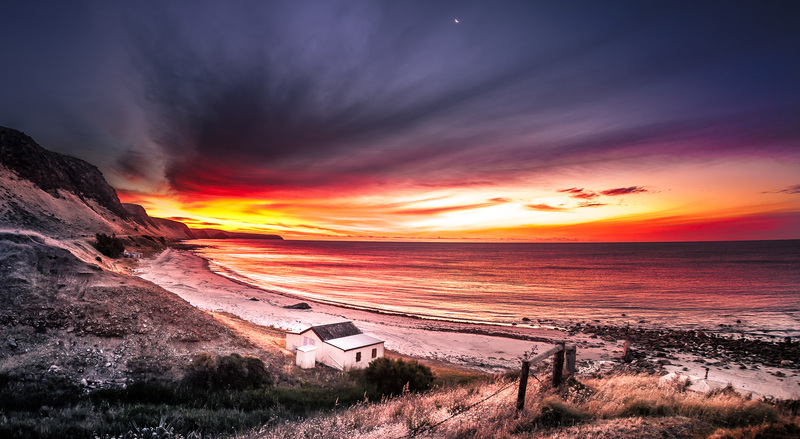 This sweeping stretch coastline from Normanville to where the road heads inland and down on to Cape Jervis overlooks Lady Bay out to sea and Rapid Head out to the west. Last night we were treated to the most incredible sunset I have ever seen and I nearly did not even notice as we were driving home from Rapid Bay. Suddenly Jennifer gave a yelp of delight and screamed ‘pull over’. Glancing back over my left should I saw it. By the time I got may camera setup on the tripod it was nearly over but even the aftermath was spectacular. This time she got the best shot of the amazing colour on her camera phone and I got the beginnings of the sky changing from a full sky of fiery orange back to twilight blue.